Editor’s Note: Originally Published March 19, 2016. 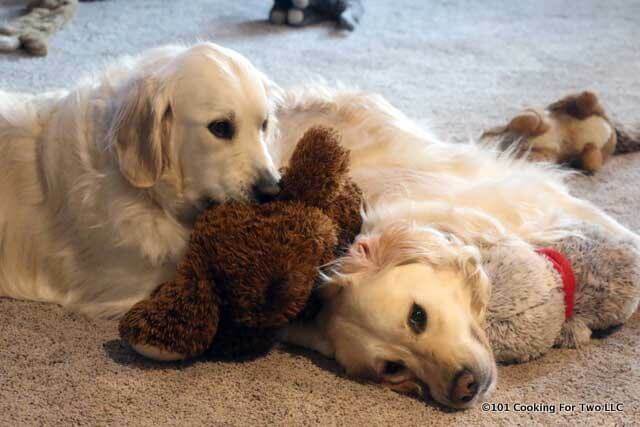 Updated with expanded discussion and updated photos. We all want a great honey glazed ham, but in the smaller household, this is a big issue. Most hams are in the 8+ pound range. That is 16 servings and a ham bone soup (see my Crock Pot Ham Bone Soup). But what to do if you don’t need that much ham? 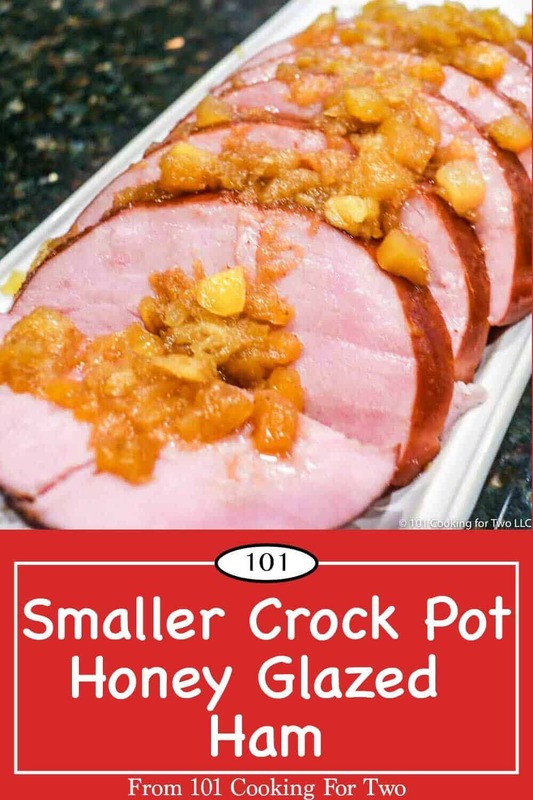 It is hard to name an inspiration piece for this recipe since I read so many recipes and combined, but probably the most informative was Slow Cooker Brown Sugar Ham ~ Holiday Dinner from the Crock Pot! At Five Heart Home. I started with a quarter of a boneless ham. You have seen them in the meat department. Not very appetizing looking is it? I have usually used them for salad toppings diced up. 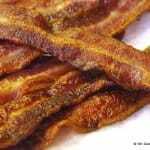 A quarter boneless ham runs about 2 to 2 1/4 pounds, which makes 4 good size servings. Just right for the smaller household. A nice solid 4. Much better than just heating it up, lots more moisture and taste. What is a Boneless Ham? 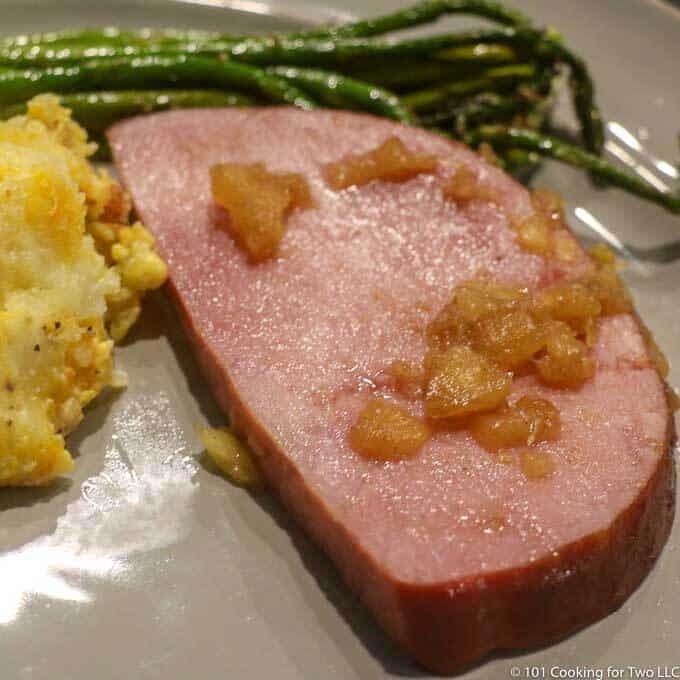 Boneless ham comes in two varieties. The first is pieces of ham pressed together. That is a canned or deli ham. Not necessarily bad but this is not what we are discussing. The second type of boneless ham will come shaped like an oval and come sealed in plastic. You can buy a whole, half or quarter ham. So great for smaller households that don’t want to eat ham for a week. They really are an actual ham with the bone cut out. They are already fully cooked and ready to eat. 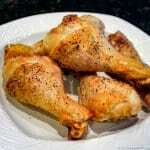 They are brined and salted like bone-in hams which makes them hard to get wrong. What size of ham to buy? 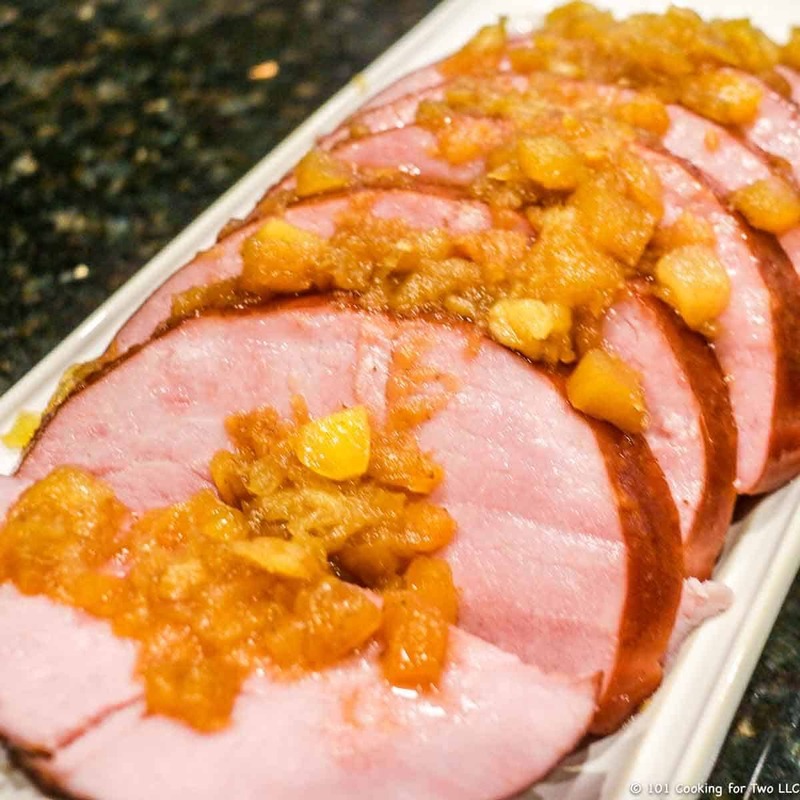 For a holiday meal, plan about 1/2 pound of boneless ham per person. For a bone-in ham, you should plan for 3/4 to 1 pound of ham per person. Since this is “cooking for two” I went for the 2.2 pound quarter boneless ham. It is perfectly safe just to cut the ham and eat it. But you want more, especially for a holiday meal. So we are adding big-time taste and moisture — worth the little trouble. Can I do a bigger ham? 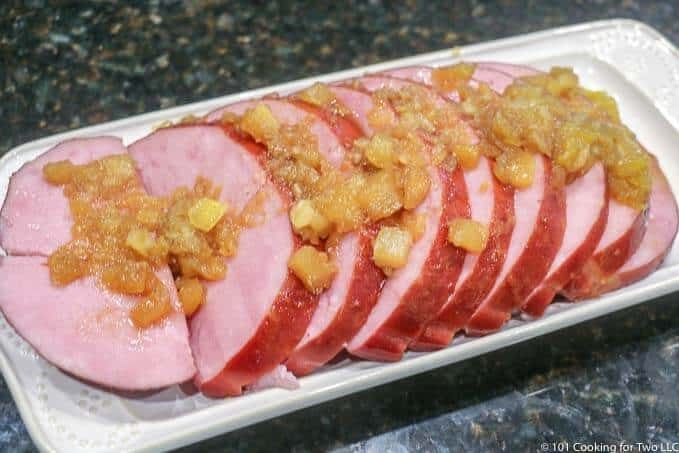 If you want to go for the 4 pounds half ham, I would keep pineapple the same and up the other ingredients by about 50%. That should take about 4 hours. The crock pot I used was 3.5 quart. I believe this would be fine in a bigger pot. Prep a small crock pot with a good coat of PAM. Place 8 oz can of crushed pineapple in the bottom the crock pot. 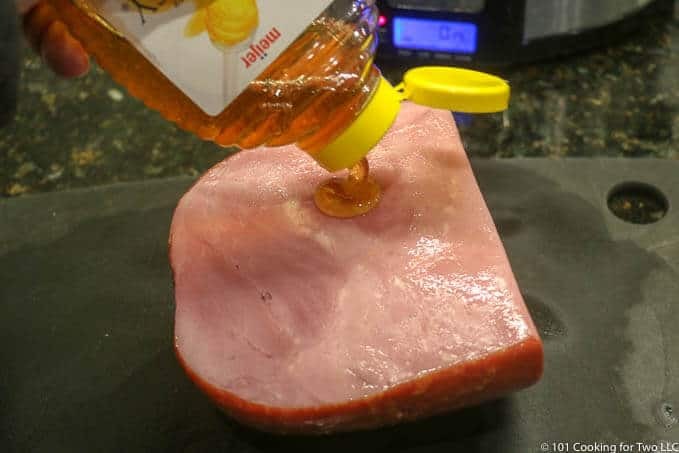 Brush the ham with a generous amount of honey, about 1-2 tablespoons. 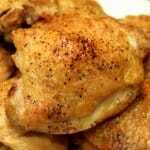 Mix 1/2 cup brown sugar with 1/4 teaspoon of ground cloves, cinnamon, and dry mustard. Pack the brown sugar mixture on the ham. 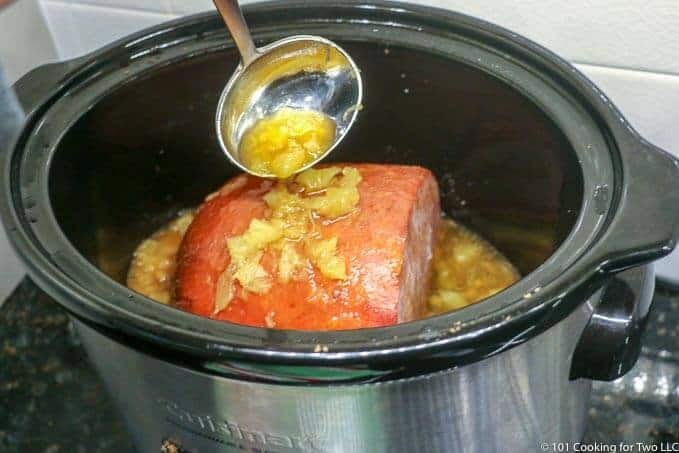 Move the ham cut side down to the crock pot on top of the pineapple. Pile any remaining brown sugar on top of the ham. Cook for approximately 3 hours on low. At about 2 hours into cooking, spoon some of the pineapple solution on top of the ham. Cook to an internal temp of 140-150. Your time may vary some due to the difference in crock pots and size of the ham. Remove from crock pot and allow to set for 5 minutes before slicing. Garnish with some of the pineapple solution. Prep a small crock pot with a good coat of PAM. Place 8 oz can of crushed pineapple in the bottom the crock pot. 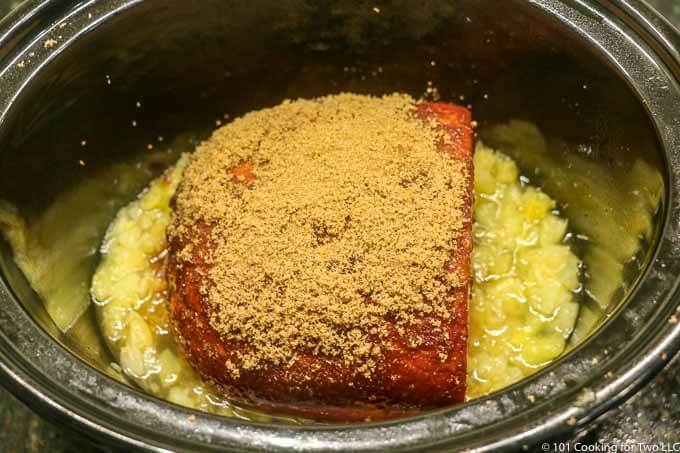 Mix 1/2 cup brown sugar with 1/4 teaspoon of ground cloves, cinnamon, and dry mustard. Pack the brown sugar mixture on the ham. Move the ham cut side down to the crock pot on top of the pineapple. 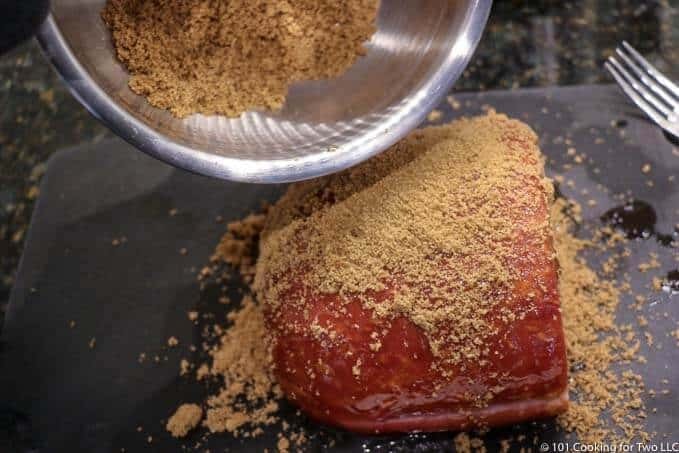 Pile any remaining brown sugar on top of the ham. Cook for approximately 3 hours on low. Plan about 1/2 pound of boneless ham per person. Since this is "cooking for two" I went for the 2.2-pound quarter boneless ham. 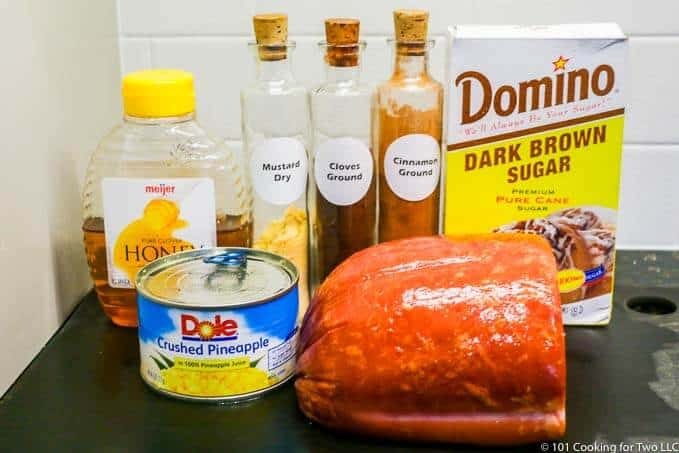 If you want to go for the 4 pounds half ham, I would keep pineapple the same and up the other ingredients by about 50%. That should take about 4 hours. The crock pot I used was 3.5 quart. This would be fine in a bigger pot. You can cut the pineapple in half but what are you going to do with it. It makes a great topping a the end. Good refrigerated for 3-4 days. Thank you so much for this way to cook a small ham ! A happy holiday to you and yours and also to your beautiful doggies ! I have a 5 quart oval crock pot. Do you know about how big a ham will fit in it? I’m planning on using your delicious recipe for Christmas. What will fit in your crockpot is somewhat determined by dimensions. About a 4 pounder would fit in most 5 qt. crock pots. If you calculate by volume, a 5 qt pat at 60% volume (the most you usually want to go) would be 3 qt. Use 1 qt for the pineapple/brown sugar etc. Then 2 qt left for the meat. There are 2 pints or 4 cup per quart. A pound of ham will be about 2 cups, so about 4 pounds in the last 2 qt of space we have. So, I’m staying with 4 pounds or slightly bigger. I would use the same amount of pineapple. Up brown sugar and spices by 50%. Paint with the honey (you may need a bit more) It should take an hour or so more. Pay attention to the temperature. Hope that helps. I have not done a 4 pounder but the above should be about right. That does affect things. It is a bit sweet anyways. So taste the ham and cut back the honey and sugar. If I thought I needed to cut back 1/3, I would cut back 1/2. So overcompensate a little. Delicious, easy, & very tasty! Put sweet potatoes (cut-skin on) at the bottom on my 4qt. crock and cooked frozen peas & carrots separately. Fantastic meal! Welcome to the blog and sorry for the late reply. I do like “dolling up” these smaller pieces of ham and making them a little special. I can only find a fully cooked small ham. Will this recipe still work? Thank you so much! This is for the “fully cooked” ham. To my knowledge, that is the only way this small hams are sold. I made a boneless 3 lb. ham yesterday in my crock pot…….delicious. My question is about the netting and if to remove it or not before cooking or after. I kept it on and removed it after cooking……………….just a guess! Which way? I would remove any net if it is plastic like. Sometimes you will have a roast with a cotton-like netting and those can be left on. When in doubt, remove it. I have never done it but my guess is about 15-20 minutes per pound at 350. It is precooked so you only want to get to 140 internal temp or so. No reason to dry it out. I don’t know if that will do much crust. You are the man Dan!!! It was just one of those recipes I had to do. Hope it works well for you. I have a bigger ham to cook. Now exactly sure of the weight but like the normal size ud buy for Easter. What adjustments would I need to make for that? Thank u!! I just made this and it was so good and juicy…loved the juice.. Yum 😋 thanks for the recipe! Thanks for the note. Exactly what I want the recipe to do. Found this recipe last night and made it for our new years dinner today. Didn’t have nutmeg or dry mustard so improvised with a little dijon mustard instead. It came out delicious! It’s only two of us so we usually don’t buy a large ham. This was perfect for the 2 lb. Boars Head that we got. It will be a regular at our house! Thanks so much! Dr Dan! Thank you so much for publishing this recipe. I have been looking for something like this for some time now. Also, you have an amazing BLOG. I just so happened to come across it this morning as I was searching for a Blackened Tilapia recipe (which I will be using yours tonight!). Keep up the great work…. and don’t worry, I will not be asking you any questions about my health. ;) Make it a great day! You will love the tilapia but watch the heat factor.